Welcome to LifeQuoteSayings.com, one of the most fun and supremely educational sites on the web, created by BrainyMedia, Inc., a corporation doing business in the Emerald State. We thought we would take a break from the skiing in the rain, to write these Terms of Service, which apply to this website, our corresponding mobile website, our LifeQuoteSayings(R) mobile app and any other online features that link to these Terms (collectively, the “Site”). This document constitutes a legally-binding agreement (“Agreement”) governing the terms of providing you with our service. We reserve the right to provide you with operating rules or additional terms that may govern your use of the Site generally, unique parts of the Site, or both (“Additional Terms”). Any Additional Terms that we publish or otherwise provide to you are hereby incorporated by reference into these Terms. To the extent any Additional Terms conflict with these Terms, the Additional Terms will control. Throughout this document, the words “LifeQuoteSayings,” “LifeQuoteSayings.com,” “BrainyMedia, Inc.,” “us,” “we,” and “our,” refer to us, BrainyMedia, Inc., as is appropriate in the context of the use of the words. Likewise, the words “you” and “your” refer to you, the person who is being presented with this document for your agreement. Also, the sky is blue and grass is green. We may update these Terms from time to time, and we may amend them at any time to incorporate additional terms specific to additional features, materials, products, opportunities, or services that we may make available on or through our Site. All such updates and amendments are effective immediately upon notice thereof, which we may give by any means, including, but not limited to, by posting a revised version of these Terms or other notice on the Site. YOU ARE RESPONSIBLE FOR REGULARLY REVIEWING THE SITE TO OBTAIN TIMELY NOTICE OF ANY SUCH UPDATES AND AMENDMENTS, AS YOUR CONTINUED USE OF THE SITE SIGNIFIES YOUR CONTINUING CONSENT TO BE BOUND BY THESE TERMS. Such changes, updates, or amendments shall not serve to constitute a default or termination by LifeQuoteSayings of these Terms. The Site provides the world’s largest famous quotations website and offers a free, all-access pass to the world of quotations. We educate and entertain audiences with family-friendly quotations from history’s most prominent figures through to today’s newsmakers – famous celebrities, athletes, politicians, authors, and everything in between. 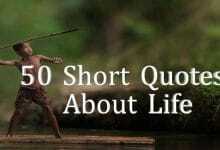 LifeQuoteSayings is supported by ad revenue generated from ads that appear on our Site. In keeping with our mission to share our knowledge with the world, LifeQuoteSayings provides a hand-selected ‘Quote of the Day’ on our Quote of the Day page, on Facebook, Twitter, Pinterest, and Google+. You can ‘Like’ us, Follow us, +1 us, or sign up for our RSS feeds to receive our daily quote in your newsfeed. Since fans share our unbridled enthusiasm for quotations, our LifeQuoteSayings submission form allows users to upload and submit quotes by famous people, provided that the user provides a reference URL as an accompanying source that verifies when, where and by whom the quote was spoken or written. While we appreciate submissions, we cannot and do not guarantee that we will publish them. Visitors can also email suggestions to us; we appreciate these, but there’s no guarantee we will follow them. The Site does not enable users to upload or post quotes directly to our Site for public view. A human being (not a quote-bot!) reviews each and every submission and suggestion submitted. While we actively respond to submissions and suggestions by making appropriate additions, changes or enhancements to our site, we do not reply to individual submissions or suggestions. By disclosing or offering any information to us, including quotes, ideas, suggestions or other information (each, a “Submission”), either through your use of the Site or otherwise, you authorize LifeQuoteSayings to make such copies thereof as we deem necessary, including to facilitate the posting and storage of the Submission on the Site. By making a Submission, you automatically grant, and you represent and warrant that you have the right to grant, to LifeQuoteSayings an irrevocable, perpetual, non-exclusive, transferable, royalty-free, worldwide license (with the right to sublicense) to use, copy, adapt, publish, publicly perform, publicly display, reformat, translate, excerpt (in whole or in part) and distribute such Submission for any purpose, commercial, advertising, or otherwise, on or in connection with the Site or the promotion thereof, to prepare derivative works of, or incorporate into other works, such Submission, and to grant and authorize sublicenses of the foregoing. You also grant us the right, but not the obligation to use your biographical information including, without limitation, your name, user name and general geographical location in connection with broadcast, print, online, or other use or publication of your Submission. You waive any and all claims you may now or later have in any jurisdiction to so-called “moral rights” or rights of “droit moral” with respect to the Submission. 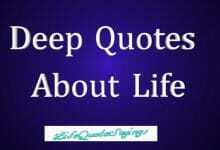 This Site may include hyperlinks to other websites which are not maintained by LifeQuoteSayings. We are not responsible for the content of such external websites and we make no representations whatsoever concerning the content or accuracy of, opinions expressed in, or other links provided by such websites. The inclusion of any hyperlink to external websites does not imply endorsement by LifeQuoteSayings of those websites or any products or services referred to therein. The terms of service and privacy policies applicable to external websites may be different from those applicable to our Site. If you decide to access any external website through a link within our Site, you do so entirely at your own risk, and LifeQuoteSayings will have no liability for any loss or damage arising from your access or use of any external website. Since LifeQuoteSayings is not responsible for the availability of these websites, or their content, you should direct any concerns regarding an external website to the administrator of that website. You agree that you will bring no suit or claim against us arising from or based upon any such use of external websites. Hyperlinks to other websites that are provided on the Site are not intended to imply that: (a) we are affiliated or associated with any external website; or (b) any linked site is authorized to use any of our trademarks, trade names, logos, or copyrights. 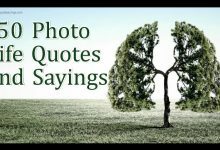 Also, all photographs published on LifeQuoteSayings, and on our ‘Quote of the Day’ social media pages on Facebook, Twitter, Pinterest, and Google+, are protected by copyright. Our photographs are so awesome, we’ve watermarked each and every one of them. You agree not to copy, distribute, display, disseminate, or otherwise reproduce LifeQuoteSayings photographs, without our prior written permission. 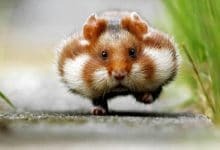 That said, there is one exception: You can share our photographs via social media as long as, and only if, they link back to LifeQuoteSayings or the Site. If you steal our images, publish them and link them back to your own website, we will find you… and that won’t be good! Share our photographs, enjoy them, be inspired by them – do not infringe on them, and we will remain friends. 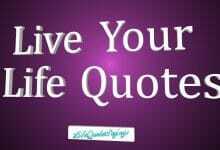 LifeQuoteSayings(R) is a trademark owned by us, LifeQuoteSayings, Inc., to uniquely identify our famous quotations website. You agree not to use this term anywhere without our prior written consent. In other words, by accepting this Agreement, you cannot use the name LifeQuoteSayings for any purpose, and you cannot use our logo on your own website, your blog, use it as your Facebook or Twitter icon, to create a temporary tattoo, or any other cockamamie reason. Now, if you get a permanent LifeQuoteSayings tattoo, we want to see it. (Photo or it didn’t happen!) We know the LifeQuoteSayings name and logo is cool, but it’s our property, not yours. Got it? Good. Where LifeQuoteSayings has given prior written consent for your use of our protected material in accordance with our above “Copyright” and “Trademarks” provisions, we may revoke that consent at any time. If we so request, demand, yell, pontificate, or filibuster, we may require that you immediately take action to remove from circulation, display, publication, or other dissemination, any of the marks, copyrighted content, or other materials that we previously consented for you to use. WE ASSUME NO RESPONSIBILITY FOR THE TIMELINESS, DELETION, MIS-DELIVERY OR FAILURE TO PROVIDE ANY CONTENT OR TO STORE ANY PERSONALIZATION SETTINGS OR USER MATERIALS. ANY CONTENT DOWNLOADED OR OTHERWISE OBTAINED THROUGH THE SITE IS DOWNLOADED AND/OR USED AT YOUR SOLE DISCRETION AND RISK AND YOU WILL BE SOLELY RESPONSIBLE FOR ANY DAMAGE TO YOUR COMPUTER SYSTEM OR LOSS OF DATA THAT RESULTS FROM THE DOWNLOAD OR USE OF ANY SUCH CONTENT. NO ADVICE OR INFORMATION, WHETHER ORAL OR WRITTEN, OBTAINED BY YOU FROM LIFEQUOTESAYINGS OR THROUGH OR FROM THE SITE SHALL CREATE ANY WARRANTY NOT EXPRESSLY STATED IN THESE TERMS. IN NO EVENT WILL LIFEQUOTESAYINGS, ITS CONTRACTORS, SUPPLIERS, CONTENT-PROVIDERS, AND OTHER SIMILAR ENTITIES, AND THE OFFICERS, DIRECTORS, EMPLOYEES, REPRESENTATIVES, AND AGENTS OF EACH OF THE FOREGOING (COLLECTIVELY, OUR “REPRESENTATIVES”), BE LIABLE TO YOU, OR ANY THIRD PARTY FOR ANY LOSSES OR DAMAGES, INCLUDING ANY INDIRECT, CONSEQUENTIAL, INCIDENTAL, PUNITIVE, SPECIAL OR SIMILAR DAMAGES, ALLEGED UNDER ANY LEGAL THEORY IN RELATION TO OR ARISING FROM THIS AGREEMENT OR OUR SERVICE, FOR REASONS INCLUDING, BUT NOT LIMITED TO, FAILURE OF OUR SERVICE, NEGLIGENCE, OR ANY OTHER TORT. TO THE EXTENT THAT APPLICABLE LAW RESTRICTS THE EXCLUSION OR LIMITATION OF LIABILITY FOR CERTAIN DAMAGES, YOU AGREE THAT WE ARE ONLY LIABLE TO YOU FOR THE MINIMUM AMOUNT OF DAMAGES THAT THE LAW RESTRICTS OUR LIABILITY TO, IF SUCH A MINIMUM EXISTS. SOME STATES DO NOT ALLOW THE EXCLUSION OR LIMITATION OF INCIDENTAL OR CONSEQUENTIAL DAMAGES, SO THE ABOVE LIMITATION OR EXCLUSION MAY NOT APPLY TO YOU. WITHOUT LIMITING ANY OF THE FOREGOING, IF LIFEQUOTESAYINGS OR ANY OF ITS REPRESENTATIVES IS FOUND LIABLE TO YOU OR TO ANY THIRD PARTY AS A RESULT OF ANY CLAIMS OR OTHER MATTERS ARISING UNDER OR IN CONNECTION WITH THIS AGREEMENT, THE SITE, OR YOUR USE OF THE SITE OR ITS CONTENTS, THE MAXIMUM LIABILITY FOR ALL SUCH CLAIMS AND OTHER MATTERS WILL NOT EXCEED $100 IN ANY CALENDAR YEAR. Copyright 2016 – 2019 LifeQuoteSayings.com All Rights Reserved.